A Jeep Rod is essentially a Jeep that has been modified on the lines of a hot rod. Hence, these vehicles offer a lowered stance, an exposed engine, and a minimalist approach towards the design. The video you see above is of a Jeeprod from Hyderabad. Based on a Jeep Willys model, this Jeeprod is powered by a six-cylinder petrol engine that comes from the 1st-generation Toyota Supra. The JZA70 six-cylinder carbureted engine from the original Toyota Supra comes mated to an automatic transmission and produces 280 PS for the first-generation Supra. For this Jeeprod, the engine benefits from a cold air intake and a sports muffler. Seen above is a beautifully modified lowrider Jeep that gets a totally all-black theme all over. The customizer has taken the all-black theme so seriously that even the wheels are dipped in black. Based on the iconic Ford Jeep, this custom vehicle has no doors and is even without a soft-top. Moreover, the video even shows this Jeep in a windscreen-less format. Another highlight of this Jeep is its audio system. The audio setup includes components from Kicker. The lowered springs and the huge wheels shod with wide rubber gives a unique look to this Jeep. Here is a video that shows a 6×6 modified Jeep from Punjab. Six-wheeled SUVs are mainly used by the armed forces on really tough terrains. Mercedes even made a road-legal version of the 6×6 G63 AMG. Based on the same lines, there are a handful of 6×6 Jeeps from across the country. 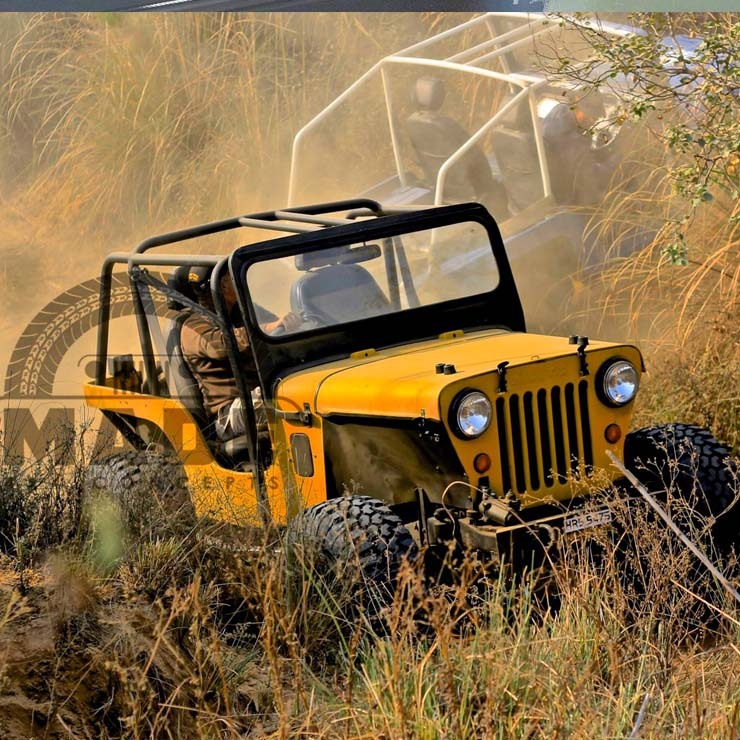 In this case, the Willys Jeep has been given a 6 wheeled format by a customizer in Punjab. Apparently, this vehicle was even on sale on an online classifieds website for Rs 7.0 lakh. Honestly, the asking price doesn’t look much if you factor in the effort that has gone into creating this highly desirable set of (six) wheels. The custom Jeep comes with a soft-top and a small loading area at the back. The attractive customized Jeep you see in the above image is from Made 4×4 Customs. The highlight here is the yellow paint job, which is probably the primary reason for a name that invokes memories of the ‘Bumblebee Camaro’ of the Transformers fame. Actually, Made 4×4 customs is a modification shop that specializes in off-roaders. This Jeep Tumblebee you see in the above image is a hard-core off-roader that gets a custom roll cage, new wheels, and a wider rubber. While there’s absolutely nothing radical about this Jeep, the various small mods it carries give it a distinct identity. Bawar Singh, a mechanic from Punjab, has designed what is probably the smallest Jeep in the world. The 60-year-old mechanic got the idea for a mini-me Jeep back in 1975, when he added two extra wheels to a scooter for a physically handicapped person. Bawar’s creation looks a lot like a scaled down Willys Jeep. It measures just about three-feet in height and is easily among the smallest four-wheelers on road today. Powering this mini Jeep is a scooter’s engine. The vehicle can hit a maximum speed of 60 kmph. The mechanic has already sold more than seven copies of this mini Jeep. He also has at least six more orders for this bespoke vehicle. Great things come in small packages, right? « Next-generation Volkswagen Polo: No-go for India?